Cleveland Browns quarterback Baker Mayfield (6) passes against the Pittsburgh Steelers during the first quarter at Heinz Field in Pittsburgh. Mayfield has continued to impress, both within the organization and externally, because of his physical and mental endurance. 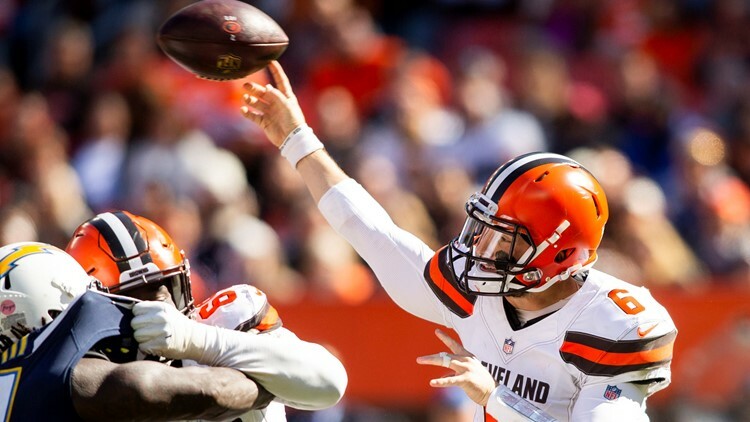 Cleveland Browns rookie quarterback Baker Mayfield has taken plenty of hits, legal and otherwise, since taking over the reins of the offense during the second quarter of a 21-17 win over the New York Jets at FirstEnergy Stadium in Cleveland on September 20. And since that point, Mayfield has continued to impress, both within the organization and externally, because of his physical and mental endurance. “Number one, I really see his toughness,” Atlanta Falcons coach Dan Quinn said of Mayfield. “Standing there, no flinch on the throws, taking shots and scrambling to go for a first down. Cleveland Browns quarterback Baker Mayfield (6) throws the ball against the Los Angeles Chargers during the second quarter at FirstEnergy Stadium in Cleveland. 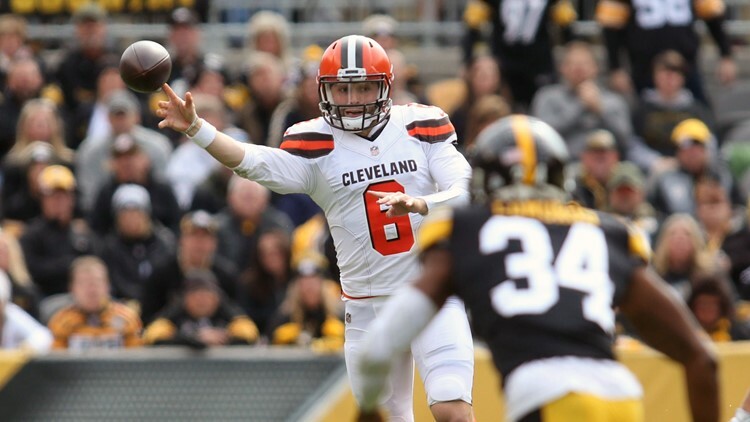 As the Falcons broke down film of Mayfield in the lead-up to Sunday’s game against the Browns in Cleveland, Quinn saw toughness…and a whole lot more in the Browns’ first-year signal-caller. “He has real confidence and accuracy to throw into tight windows. It might be man-to-man coverage, so the ball has to be at such a precise location and I have seen him do a good job with that,” Quinn said. “He throws a good deep ball, too. They are able to take their shots based on the speed. 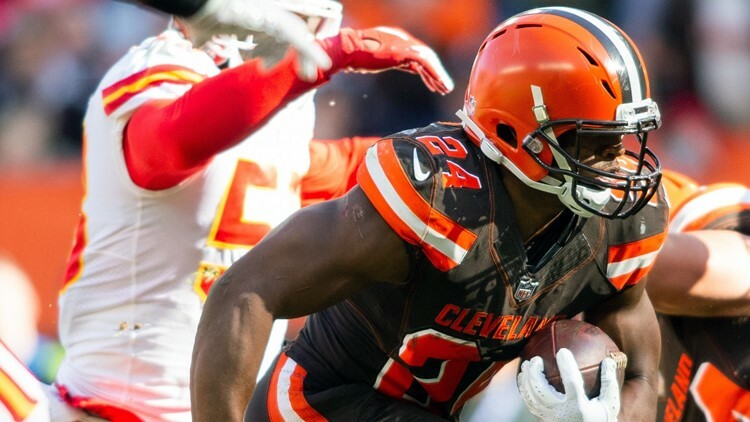 Quinn has been impressed with Mayfield’s abilities, but also, how his skills work in tandem with those of rookie running back Nick Chubb, whose flashes of potential in limited duty early in the season led to the Browns parting ways with veteran Carlos Hyde in a trade to the Jacksonville Jaguars in October. “He is tough,” Quinn said of Chubb. “We loved him here because of his style, his attitude and what he stands for as a player. It is the yards after contact and some people may have questioned how do the big backs do when they get in the NFL. Are they able to still get yards after contact like they did in college? And the answer to that question, in his case, is absolutely. Cleveland Browns running back Nick Chubb (24) runs the ball into the end zone for a touchdown against the Kansas City Chiefs during the second quarter at FirstEnergy Stadium in Cleveland, Ohio. Mayfield completed 159 of his 265 attempts (60 percent) for 1,768 yards and 10 touchdowns against seven interceptions despite being sacked 22 times for 154 lost yards through his first seven games at the professional level. Additionally, Mayfield rushed for 91 yards on 15 carries, an average of 6.1 yards per attempt.